Local people should be enabled to generate income from tourism to alleviate their poverty level. Income realized from tourism activities should be used to develop communities by providing basic facilities. Preservation of our delicate natural resources and endangered animal species should be ensured or encouraged. Tourism activities should be organized with respect for indigenous cultures and traditions of our people. Below are only a few of the official projects, that are among the most fascinating eco-destinations in Ghana and the following attractions are part of the main destinations of Jolinaiko's tours. Others can be found on our interactive map of destinations. 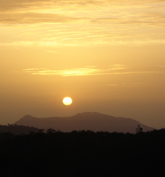 Liati Wote is one of Jolinaiko's favourite ecosites. 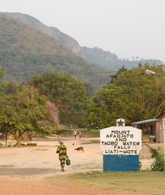 This pretty village close to the Togo border is located at the foot of Mount Afadjato. The country's highest peak (885 m) offers great hiking possibilities to the top of the mountain or through the tropical forest to the Tagbo waterfalls. The delicious meals served in Stella's Inn already are enough reason to travel all the way to Liati Wote. Amedzofe is a pretty settlement on the slopes of Mount Gemi, one of the highest mountains (760 m) in Ghana. Enjoy the panoramic views and let your heart beat while taking an adventurous descent along a sleep-sided mountain to the Gbadzeme waterfalls. Our guide likes to take you to one of our befriended communities where you enjoy the hospitality of the chief by drinking palmwine or fresh coconut juice. The Boabeng Fiema Monkey Sanctuary was created to protect the monkey population around the villages Baobeng and Fiema. 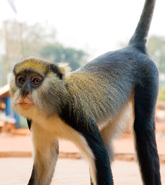 The inhabitants of the villages regard the Mona monkey as sacred and this is the reason that the significant monkey populations have survived here in contrary to most other parts of Ghana. It is a special experience to see this normally shy forest monkeys interact at such close distance. 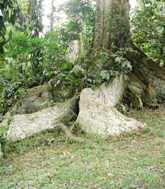 The Bobiri Forest, about 10km from Kumasi, is one of the best preserved tropical rainforests with many tall and ancient tries and a flamboyant flower garden attracting over 500 species of butterflies, mainly from April till June. Enjoy your meals and the serenity while sitting on the veranda of the pretty wooden guesthouse in the middle of the beautiful forest. Bunso Aboretum is a protected forest reserve and is home to an extensive variety of plants, trees and herbs. More than 100 bird species have been recorded and there is a butterfly sanctuary within the aboretum. 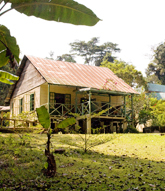 While lodging at the colonial guesthouse, Jolinaiko Eco Tours will prepare you a delicious meal with staple food and vegetables straight from the forest. 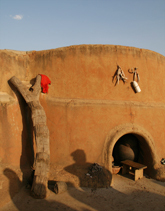 Situated close to the Burkina Faso border, the sub-Saharan village Sirigu is well-known for its pottery, basket weaving and unique symbolic wall decoration. There is a community guesthouse built in the same style as the surrounding compounds. It is breathtaking to spend the night at the top of the roof viewing a heaven full of bright shining stars. Tafi Atome Monkey Sanctuary is like a sister sanctuary of Baobeng Fiema as it harbours a similar population of the sacred Mona monkeys. The story goes that the ancestors of the modern villagers came from Brong Ahafo and brought with them the fetish for monkeys and up till date, this fetish still exist. 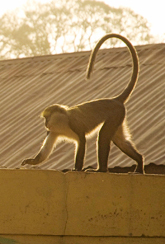 Enjoy spotting these little monkeys from a close distance in this typical little village in of the Volta region. 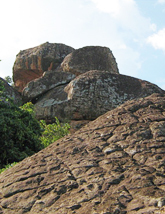 Tano Sacred Grove encloses a cluster of striking sandstone rock formations which were one of the earliest settlements of the Bono people. The area offers great hiking possibilities through a beautiful environment of towering rock formation within a semi-deciduous forest. 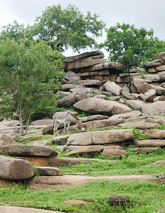 The area of the Tongo Hills is unique for its architectural landscape of granite rock formations and are considered one of the most important cultural sites in West Africa. Explore the natural caves that have been used as sacred shrines by the local people for centuries. Visit the yearly vibrant Golob or Boar' daam festival (in october) with Jolinaiko Eco Tours. The Tengzug shrines are a proposed UNESCO World Heritage site. 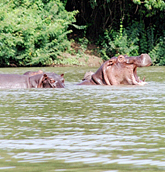 The Wechiau Community Hippo Sanctuary is the best preserved hippo sanctuary in Ghana. Even though it is located in a remote area, it is highly rewarding to pay a visit and watch the hippo population from a canoe on the Black Volta River. The sub-saharan area has a lot to offer, like bird watching, mountain biking, and meeting the indigenous Lobi and Dagoma people. Spend an extra-ordinary night on a platform built in the top of a silk cotton tree. The wetlands of the Avu Lagoon harbours a great diversity of birds. Enjoy the abundant flora and fauna early in morning while paddling a canoe on the Lotor river. Meet local people and observe their local fishing practises. Have a face-to-face encounter with crocodiles near the Chief or Zenga Pond. 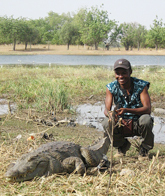 The crocodile are regarded as sacred since the local Kassena People believe that the souls of the ancestors reside in these animals. We also visit the relics of the The Nania Slave Camp, a hidden northern slave market that fed the southern slave sales in the 19th century. Besides the 'official' eco-tourism sites, there are many committed and inspiring persons and organizations taking their responsibility by linking tourism to community development or nature conservation. Therefore, a list will always be incomplete. Besides the list below, there are many others, most of which can be found on our interactive map of destinations. MARVEL stands for: MEET AFRICA Rural Village Experience and Lodging. MARVEL has been initiated by our befriended organization 'Meet Africa'. They offer a unique experience in the villages Sognaayilli near Tamale and Gowrie near Bolgatanga. You can stay in a host family and live with the local people. You can learn about the rich Dagomba culture and traditions and relax and enjoy the beautiful scenery. Your contribution is used for the development of the village. Nzulezu Stilt Village is an amazing community built entirely on stilts in the middle of Lake Tadane. All structures are suspended over the water and transport is only by canoe. 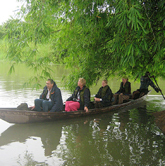 The excursion to Nzulezu involves a fascinating canoe trip through the Amansuri Wetlands and across the lake. It is a lovely trip on which you can see many different kind of water birds. Nzulezu lies about 5 kilometres from the town of Beyin. Most of the inhabitants are farmers and fishermen. According to tradition, ancestors of the village were brought to their present place under the guide of a snail. Nzulezu is also a proposed World Heritage site. Meet Mister Cedi, member of the Nene Nomoda family, who runs a local glass beads factory. Watch the century old process of beads making from start to finish. Larabanga is well-known for its 13th century mosque constructed of mud-plaster and wood in a Sudanese architectural style. The building has to be renovated each year, because of the damage of the rains to the mud structure. You can also visit the 'Mystic Stone'. The Salia twin brothers who are natives of this little town, are the main engines behind the Tourist Information Center where contributions are raised among tourist to improve the water supply and quality in the town and surrounding communities. The Natura Eco Lodge is an initiative of Orphan Aid Africa. Situated at the foothill of the Akwuapem Mountain Range, the lodge exist of round mud brick houses with thatched roofs surrounded by colourful bourgainville. Income generated from the guesthouse goes directly to the adjacent Orphanage Africa Children's Home. The small ecological garden offers fresh vegetables for both the guests and the orphans. A maternal policlinic for women and children in the community has been built recently. Located close to Accra, the Nature Eco Lodge is a nice hide-out for a lunch or a traditional dancing session on Sundays. The town Yendi, in the remote eastern part of the Northern Region, serves as the capital of the Dagomba Kingdom. The Dagbon must have been one of the most impressive settlements in West Africa and up till date the Dagomba people remain loyal to their tradition and culture. There is a rich history, strong trade and cultural links with the Islamic world and the colonial influences of the German, as Yendi fell into German territory when the state was split between the British Gold Coast and German Togoland. Yendi is best visited on Monday and Friday, when the Ya-Na (the chief) holds open court in company with his traditional delegation. The Dagbon Tourism for Peace Foundation tries to promote tourism as a tool for peace building since there has been some tribal turbulence within the Dagbon Kingdom. If you are looking for a serene hide-out for relaxation in the middle of beautiful nature, XOFA ecovillage is the ultimate place to go. Located at the foothills of the Akwuapem Mountains and on the southern shore of the Volta Lake, XOFA is a little settlement existing of basic accommodation and in natural style built huts. Forget everything around you while hanging in you hangmat enjoying fresh fruit juices, or ask the local fishermen to paddle you across the lake to the little inhabited islands. There are a couple of initiatives between XOFA and the nearby village, which is a pretty place to stroll around. Upon leaving, you are asked to symbolically plant a young mango tree. “ We travelled three weeks through Ghana with Apollo. 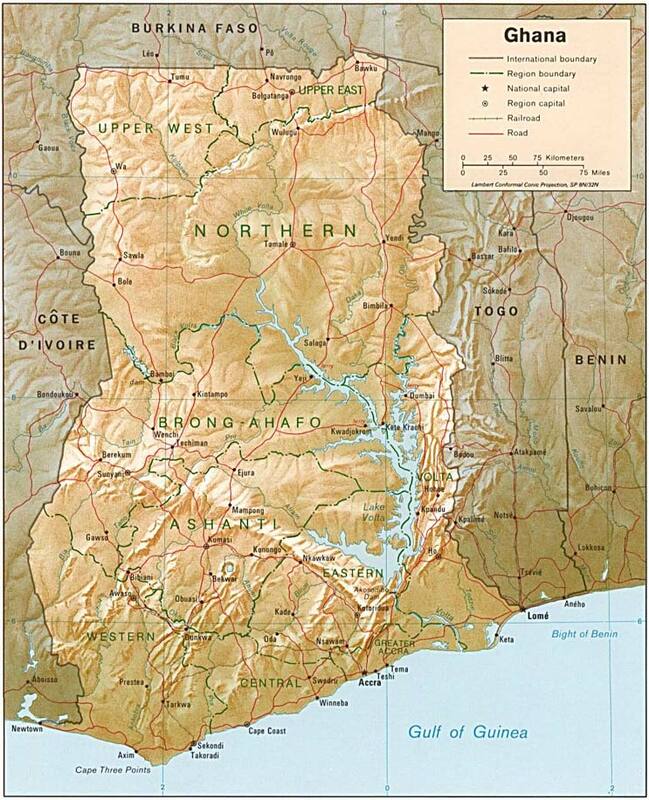 From Accra westward along the coast as far as Nzulezo stilted village, and north to Kumasi, from there to the east, east of Lake Volta and back again to Accra. The journey in one word: fantastic! Travelling with Apollo as a guide, we visited local initiatives for tourism like Bunso Arboretum, Tafi Atome Monkey Sanctuary and Liate Wote, where we climbed Ghana's highest Mountain (which, by the way, has a quite moderate height). Being with Apollo made it quite easy to come in contact with Ghanaian people and that was what I liked most during this trip.